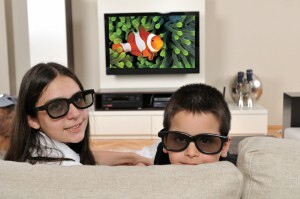 Think letting your kids veg in front of the computer TV for hours on end isn't doing any harm? Think again. Results of a new study indicate that children who enjoy too much screen time can experience narrowed arteries in the backs of their eyes, which can be a precursor to heart disease. The research was conducted by Australian scientists and what they found was that in kids who regularly participated in outdoor physical activity have a larger average arterial width than those who engaged in a more sedentary lifestyle, and researchers say that when it comes to being healthy, it all begins with the parents. Encouraging your kids to stay active also has advantages that extend beyond reducing their risk of heart disease and other ailments. For starters, spending too much time playing video games and watching TV can make children especially irritable. Making sure they turn off the tube and get outside may not only make them healthier, but happier as well – but how do you do it? There has to be some sort of structure, simply telling your kids to go outside and play won't do much. They'll get bored, come back inside, and start the whole cycle over. Instead, go out with them. Take a walk, ride bikes, shoot hoops – it doesn't really matter as long as you're involved in some capacity. Eventually, getting away from the TV or computer will be no problem and you'll have healthier, and happier, kids.